Gill met with Yannis to discuss the conceptual figure that he and Daniel will need for their upcoming journal paper. The figure will show three different methods for the administration of oxytocin; intravenously, using an infuser; intra-nasally, using a diffuser; and intra-nasally, using a conventional spray. The figure will have to include an anatomical head that includes the trigeminal and olfactory nerves, to indicate possible routes for the transport of oxytocin from the intra-nasal cavity to the brain. There should also be an indication of a vein, leading into the brain, to highlight the intravenous route. Yannis also wants to demonstrate that oxytocin has an affect on many organs in the body, so a human torso, showing the heart, stomach and reproductive organs, should be linked to the head in some way. Left. Figure from Young, L.J. and Barrett, C. E. (2015) Can oxytocin treat autism? Science, Vol. 347, Issue 6224, pp. 825-826. (editorial illustration by C. Bickel / Science) Right. Fig 1. from MacDonald, K. and Feifel, D. (2013) Helping oxytocin deliver: considerations in the development of oxytocin-based therapeutics for brain disorders. Frontiers in Neuroscience, March 2013, Vol. 7, Article 35. Similar to Barbara and Mattia’s requirements for their figure (discussed in this blog post) Yannis would like the ‘ultimate’ conceptual figure, that shows all of the delivery methods for oxytocin. And, as for Barbara and Mattia’s figure, Gill’s intention is to produce a flexible figure that can be easily edited to show a number of different combinations of oxytocin delivery, and can be adapted to suit either printed journal papers and posters or PowerPoint presentations. An anatomical human head, including the nasal cavity, brainstem, cerebellum, hypothalamus, pituitary gland and cortex, together with olfactory and trigeminal nerves. 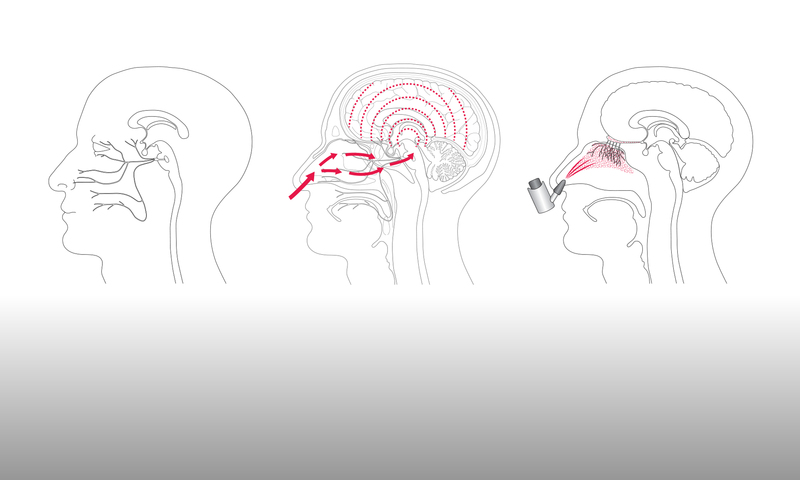 An intravenous diffuser, with a cannula connecting to a vein leading into the brain. An anatomical human torso, including (as a minimum) heart, stomach and reproductive organs. Two versions of the torso will be produced, one with female reproductive organs and the other with male. The figure will have to include graphic elements that indicate how the oxytocin may be transported from the site of administration into the brain and to the rest of the body. As one of the aims of the CNS is to have a consistent departmental style for their conceptual figures, Gill’s intention is to draw the elements so that their visual style will match with those elements being produced for Barbara and Mattia’s figure, and with the visual elements that have already been produced for Nisha’s figure (see this blog post). As for Barbara’s and Mattia’s figure, Gill will collect examples of the visual elements that she has not yet drawn – the human torso being an obvious example. Once she has produced representative examples of all of the required visual elements, Gill will meet with Yannis and Daniel to work together to construct the figure in Adobe Illustrator. The process will be documented in future blog posts.